Guess Who is Helping Veterans Get Home for the Holidays? | Hupy and Abraham, S.C. Guess Who is Helping Veterans Get Home for the Holidays? This story reminds me of a song-favorite that was very popular when our young men and women were serving in Europe and the Pacific during a brutal war decades ago. “I’ll be Home for Christmas,” a smash hit sung by Bing Crosby in 1943, was many a family’s dream then, but that promise is equally compelling today. With so many military members deployed far from home, getting back to see family and friends during the holidays is very difficult if not impossible. Enter a partnership of some interesting and patriotic business leaders. Operation Ride Home is a program that assists active duty U.S. military personnel in traveling home to visit their families, through a partnership with the Armed Services YMCA (ASYMCA). This wonderful program caught the attention of the Jack Daniel’s Distillery, which was celebrating its 150th anniversary. 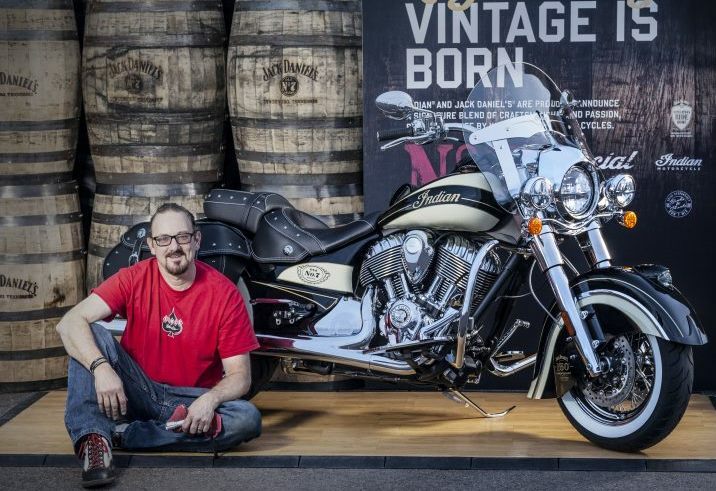 To commemorate that occasion, Jack Daniel’s collaborated with Brian Klock of Klock Werks Kustom Cycles of Mitchell, S.D. The Klock Werks is well-known for its innovative designs and creations, most notably the Flare windshield. The Klock Werks has been very successful in manufacturing custom accessories for various motorcycle brands and has been working extensively on products for the Indian Motorcycle line. Together, Jack Daniel’s and Klock Werks designed 150 limited edition Indian Springfield™ and Indian Chief® Vintage models, priced at $29,999. Indian, America’s First Motorcycle Company®, was the first brand to capture a sanctioned Jack Daniel’s livery status in the 150 year history of the distillery. That special distinction might have added to the reason the total 150-unit commemorative production sold out eight hours after being offered to the public. Actually, only 149 units were sold. Serial number 001 was held in reserve for a very special reason. 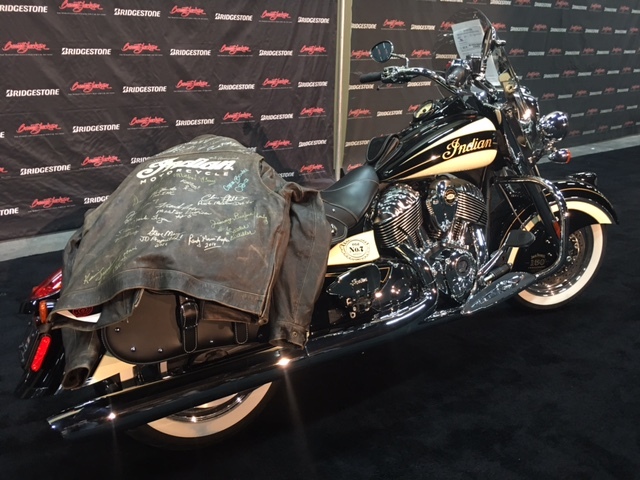 #001 of the limited edition series, an Indian Chief Vintage version, was auctioned at world-renowned Barrett-Jackson Las Vegas on October 15 at the Mandalay Bay resort. Collector Vincent Amato won the bidding for this one of a kind classic, offering $150,000 for the privilege of taking the bike home to display in his collection. The full $150,000 of proceeds from the auction will benefit Operation Ride Home. To put that in perspective, approximately 700 people, both military and family members, will be able to enjoy each other’s company this holiday season, thanks to the generosity of Mr. Amato and the vision of Jack Daniel’s and Brian Klock. Both Limited Edition Jack Daniel’s Indian Springfield and Indian Chief Vintage models feature an array of genuine Indian Motorcycle accessories, as well as Jack Daniel’s-inspired custom paint and logos, badging, leather saddle and saddlebags. Each fender is inscribed with the names of the seven Master Distillers who have overseen the Jack Daniel’s distilling process over its 150-year history, and an inscription of Jack Daniel’s “Bottles and Throttles Don’t Mix” mantra which reminds riders that drinking and riding are meant to be enjoyed separately. Finally, both models also came with a custom-printed Jack Daniel’s whiskey barrel top to commemorate each bike, a two-year unlimited mileage factory warranty and free membership in the Indian Motorcycle Riders Group™ for one year.